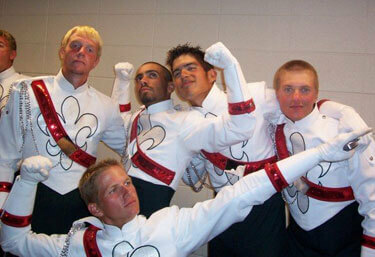 This is the 2006 Madison Scouts scaffolding crew on Finals night of the 2006 DCI World Championships. We were quite possibly the fastest scaffolding crew in DCI, and this is a great group of guys. Left to right: Bret Brawner (euphonium), Daniel Sanchez (contra), Stephen Chitta (baritone), Colby Garretson (euphonium), and me at the bottom.